BEST ALTERNATIVE to the Expensive Brand Alcohol Markers with 40 Vibrant Colors. If you are looking to get an inexpensive Artist Grade Alcohol Based Markers set with a high quality feel and look, here they are. The Premium Colored Art Drawing Marker Set includes some skin tone markers such as blush, skin white and barely beige. 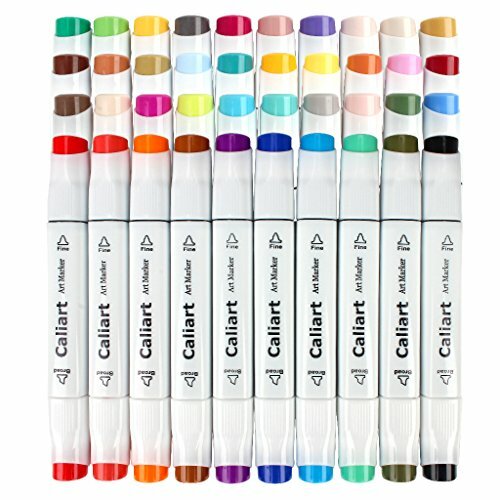 Caliart Dual Tip Twin Permanent Markers allow you to draw at least 1,000 feet and are non-toxic. Perfect for use on paper, ceramics, glass, wood, cloth, canvas and more. HIGH QUALITY: These are highly pigmented and vibrant coloring artist markers built to last against fading, work well with no skipping or ink flow issues, ink dries fast and doesn't smudge. They can be used to change shades in different colors to do adult coloring, animation, Illustration, painting, card making, fashion design, writing, sketching and drawing. Perfect gift idea for Christmas, Thanksgiving, school students, kids, families, friends. COLOR-CODED CAPS: The color-coded caps allow for ease in organization and to identify colors quickly. Ergonomic design makes working with these markers easy for a long time without fatigue. BONUS CASE: Equipped with a beautiful form-fitting black carrying case perfect for traveling and storing. Moreover, Caliart provides more than 100% Satisfaction Guarantee to customers.